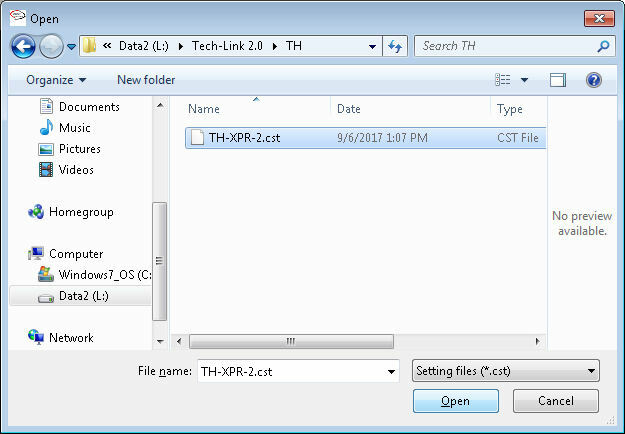 Download the desired TH-2 XPR software application using the links above. The downloaded software is in a folder contained in a zip file. The folder will be named TH, CA, UM etc. already exists you must either rename it or delete it first. Follow steps 2 and 3 for each software application you want to install. 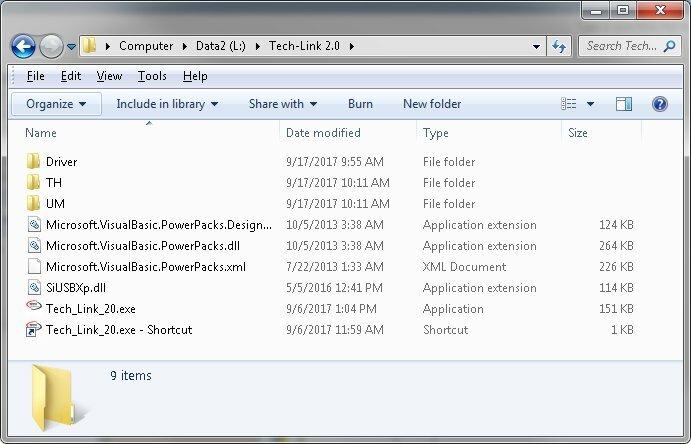 Tech-Link 2.X can now be used to load the software and settings and to modify the settings etc. which has a ".cst" extension, these two files must be loaded before using the TH-2 in your application. Be sure external power is removed and connect the TH-2 XPR to the PC with the USB cable. This will put the unit into Program mode. 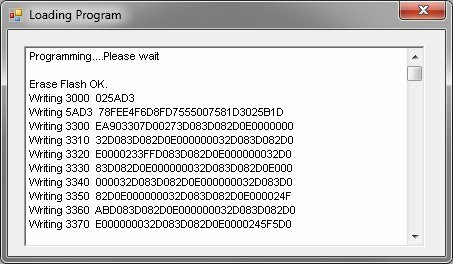 select the desired hex file. In this example, the tandem software TH-XPR-2.hex is selected. Click Open, wait until the "Programming completed successfully"
window appears. Close the windows. select the desired settings file. Note: Choose the same folder that you used for the program load. In this example, the tandem settings TH-XPR-2.cst is selected. 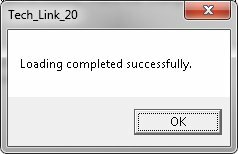 Click Open, wait until the "Load completed successfully"
Load the Program file i.e. Tandem, Coax, Universal etc. 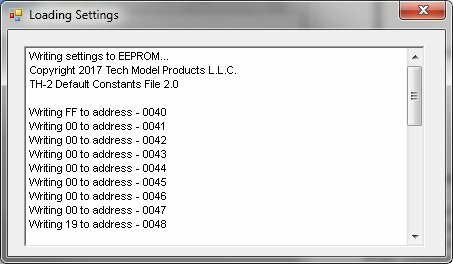 Load the Settings file, stock or customized. Connect the TH-2 XPR to your application - Connect inputs, outputs and power. Turn off all swashplate mixing done by your transmitter. If your application has any swashplates then get the collective pitch function working first. Adjust the servo reversing settings (TH-2) to get all servos moving in the same direction. If needed, reverse the function direction (stick movement) by reversing it in the transmitter. reversing in the transmitter as needed. Adjust the servo centering settings as needed (TH-2). Assign the desired gain settings to the external gain controls PT1..PT4 and X.
would be a program mix of elevator master and CH5 slave. Double check the directions on any external gyros. The TH-2 requires a 5 volt power source. It must be maintained between 4.9 and 5.5 volts. Do not exceed 5.6 volts since it can damage the unit. A 5V or 5.5V BEC with a battery large enough to supply the power is recommended. little power so you need to determine how much current is required by all of the components in your model. model setup that has a receiver, 6 micro servos, and 2 gyros. A BEC with 3 to 5 amps capacity would be needed. For large or digital servos you will need to use extender boards or similar, which allow you to route power directly to the servos bypassing the TH-2. The TH-2 in this case, only drives the servo input signals which are low power. The USB cable must be plugged into an un-powered TH-2 to initially connect with Tech-Link. This puts the unit into Program Mode. Power is supplied by the USB cable. No damage will occur if you forget to remove power first. It just won't connect, and and error message will be displayed. value will stay set to the last value it was when disconnected. for the application for details. in the event of interference. Once the TH-2 is programmed and setup with your PC, there is no longer any need to have a PC at your flying field etc. All adjustments can be done with your transmitter or the five external gain/setting inputs. the connectors. Using the secondary power inputs (even if not required) provides redundancy and is recommended for safety. The Servo Drive Table below summarizes the possible combinations of different servo counts and sizes with the required power inputs. 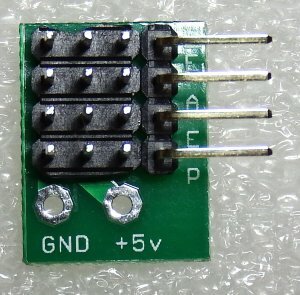 Notes: 1: Secondary power is not required when extender boards are used. 2: N/A means Not Applicable. 3: Any unused header power pins can be used as secondary power inputs. The TH-2 XPR requires a low jitter receiver/gyro to operate properly. The receiver/gyro should have a jitter level of about 1 to 2 microseconds or less. the mixing. Any receiver or gyro jitter error adds and subtracts, with mixing, which in some cases doubles or halves the error. A typical servo has a deadband of about 8 to 10 microseconds, any jitter above the deadband will cause the servo to hunt and twitch. The TH-2 XPR will work with either "Heading Hold" or standard gyros. We recommend using a Futaba GY240 type gyro. Other units on the market may perform just as well, we just have not tested them yet. The GY401 gyro has been tested and works fine. The gyro should be set to work in "analog" servo mode. The FS8 Copilot system has been tested and works fine. DX7 and DX6 radios have been tested and work fine. They output the data just as a PPM receiver does with a 22ms frame rate. Note: Some PCM receivers output servo data "non-sequentially" and may not completely work with the TH-2 XPR. the receiver to the TH-2 XPR will cause the servos to operate erratically. The TH-2 XPR does provide clamping to the servo outputs to prevent damage. whatever it is connected to at the time. The TH-2 XPR supports most radios such as Futaba, JR, Hitec and others without modifications. Caution: Power should be removed or switched off when making any kind of connections to the TH-2 XPR. This includes the USB. power pin. The appropriate connector adapters must be used in this case. The TH-2 XPR has 6 inputs that come from the receiver/gyro. Single 3-wire cables or the "6-input" cable can be used. Aileron input plugs directly into the receiver's Aileron output or optional gyro. The gyro if used, plugs directly into the receiver's Aileron output. Elevator input plugs into the receiver or optional gyro. The gyro if used, plugs directly into the receiver's Elevator output. Rudder input plugs into the receiver or optional gyro. The gyro if used, plugs directly into the receiver's Rudder output. CH5 input plugs into the receiver or optional gyro. The gyro if used, plugs directly into the receiver's CH5 output. Pitch plugs into the receiver or optional gyro. The gyro if used, plugs directly into the receiver's pitch output. NOTE: A gyro must not be used on this input for some apps. Refer to the apps specifications. X input plugs into the receiver and a gyro should NOT be used here. This input is used as an external gain or setting control. 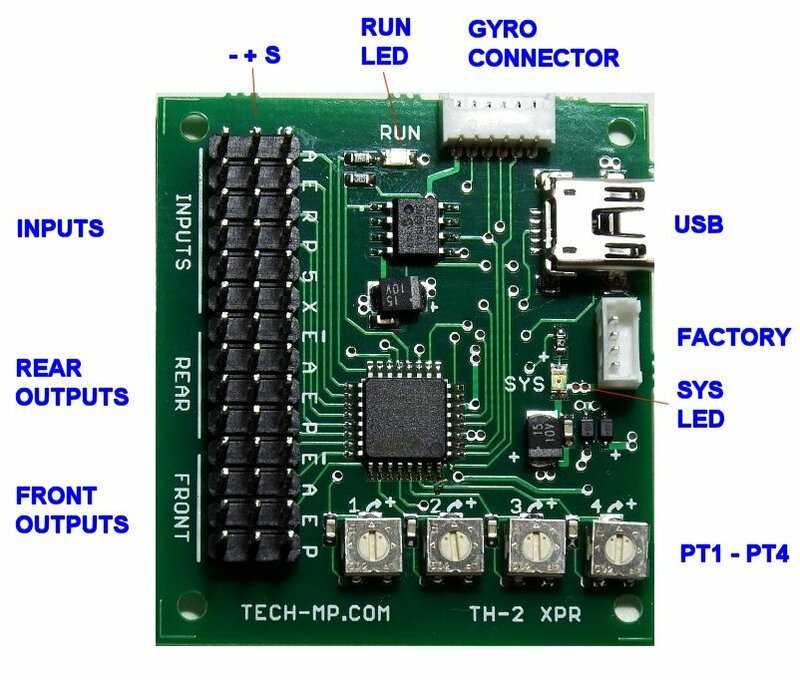 The TH-2 XPR has 8 servo outputs. The servo connectors can be plugged in directly to the servo outputs on the main header. The servo signal wires must be facing the labels A, E, P or Ep. Connecting the servo connector on backwards will not harm anything. The servo just won't operate. When using extender boards and long signal wires, it may be necessary to use ferrite rings on the signal wires to prevent glitching. This will depend on your particular installation. a valid software application was loaded. Check that the power is connected to the main header and the battery is charged. Check that transmitter is on and operating properly. Check that receiver is on and operating properly. Check that the receiver/gyro inputs are connected properly. In some applications, the pitch input must be connected and active. Inspect the model for flightworthiness. Perform a radio range check before attempting to fly the model. Check that the TH-2 is operational (RUN LED blinking).